Sucre is an official capital of the most high-mountain country in South America – Bolivia. This city is also situated on the very high altitude of 2750 meters, which might be a cause of comparatively small number of inhabitants (about 280 thousand people). However, it does not stop this city to be one of the tourist destinations due to multiple cultural and natural places of sightseeing. The settlement of Sucre was founded by Spanish colonists in 1538 and during the historical development its name has changed for several times. In particular, it was called Audiencia de Charcas (by Spanish King Philipp II) since the date of its appearance, La Plata (because of natural deposits of silver nearby) and Chucuisaca (nowadays it is a province Sucre is a center of). In 1840 this town has obtained its modern name, which was given in order to glorify the Independence War leader and eventually the second President of Bolivia (after Simon Bolivar) Antonio Hose de Sucre. Sucre is often referred to as the White City, where most of the buildings are made of white color materials, which underlines the colonial features of the settlement. 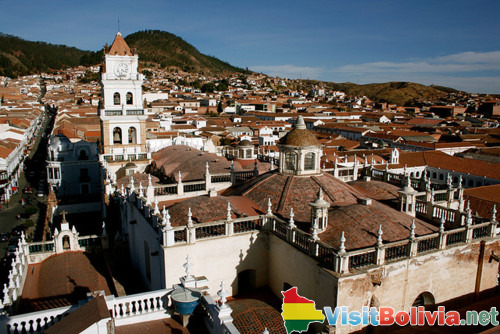 Moreover, the white part of Historic City of Sucre has been added to the UNESCO World Heritage List in 2011. Among specific places to visit Plaza 25 de Mayo should be mentioned – the center of Sucre city. Here one may see a set of City Hall, cathedral, Casa de Libertad (the place, where in August 6 1825 the Independence of Bolivia was proclaimed) and other buildings of colonial period, which are supplemented with multiple cafes, restaurants, hotels and souvenir gift shops. On the center of the Square the monument to Antonio Hose de Sucre is situated. All in all, Plaza 25 de Mayo is a place, where one might observe the tide of life in Sucre City. Being a town with bright history, there is no surprise in establishment of many interesting and exceptional museums. La Recoleta Museum is located not far from the city center, being organized in the monastery of Franciscan Order of 1601. It is the peculiar place to visit due to multiple variations of its main purpose as time passed. To be more detailed it was a nunnery, a museum, a prison and even a caserne. During the excursion tourists can enter the priest’s cell with one blanket and whip (the stuff of self-flagellation). The list of other museums worth visiting includes National Anthropological Museum, De Charcas Museum (the exhibition of man-made furniture in Indian style), Museum of Modern Art, and Museum of Ethnic Textile. Aside from others National Mint of Bolivia (Casa de la Moneda) should be underlined, located in Potosi, suburban town of Sucre and one of top 10 interesting places. This is also a place of one more National Museum, which preserves luxury items made of precious metals as well as the collection of religious art. Being located in extraordinary natural environment, Sucre can also boast of various attractions of this kind. Besides picturesque landscapes, which might be observed during mountain excursions, Cal Orko should be underlined as the largest paleontological spot in the world. In 1994 workers of the cement plant discovered a wall with 6000 dinosaurs’ traces. Their age is likely to be 68 million years old, when the ash of the volcano eruption buried the remains of the biggest prehistoric animals on the Earth in the area. On the distance of 65 km Tarabuco market might be attended, which functions only on Sundays. It's one of 10 shopping centers in Bolivia and it is the center of Indian Yampara culture, where even nowadays locals wear their ethic clothes (mostly in order to attract tourists and to promote their trade). Tarabuco market is famous for numerous items of arts and crafts and traditional fabrics, which might be purchased with money or on barter conditions. Notwithstanding that Sucre is not the biggest city in Bolivia, it is still its constitutional capital, the historic place of Independence announcement and cultural spot of the country. Hence, the recognition of Sucre as a crucial place for Bolivians as well as a tourist attraction is obvious and undisputable.